one of our favorite bike/ped trails. The Schuylkill River is a finalist in the 2013 PA River of the Year Contest. It is currently in 3rd place behind the Lackawanna and Monongahela Rivers. The award is an honor bestowed upon a Commonwealth river to elevate public awareness about that resource and recognize important conservation needs and achievements. The Schuylkill River is home to our longest and most beloved trail on The Circuit. 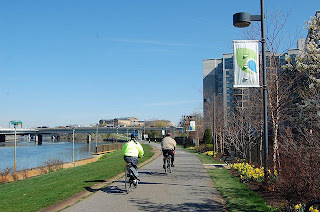 Take a moment to vote for the Schuylkill and encourage your friends to vote!